Provisional booking held for 5 days. Holding deposit (£100 per week) required on booking. Full payment required 6 weeks prior (plus a returnable £100 security bond). Full booking criteria available on request. Less than 7 night stays may be available out of season. Prices are per week and run from Saturday to Saturday. THE CARAVAN: The caravan is located on the wonderful Parkdean Holiday Park at St. Minver near Rock in Cornwall. It can sleep up to 6 people and has 3 bedrooms. The caravan benefits from double glazing and central heating throughout.The lounge has double doors that open out onto the front decking, a 4 seater and 2 seater settee and an electric fire.The main bedroom has a double bed, overhead cupboards, a wardrobe and a USB port. The other two bedrooms each have twin beds although in one of these, the beds can easily be put together to make a standard double bed. They too have overhead storage, and a wardrobe and drawer unit. The fully fitted kitchen includes a built in microwave, double oven, extractor hood plus a large integrated fridge freezer and plenty of storage space. The shower room has a shower, sink and toilet. 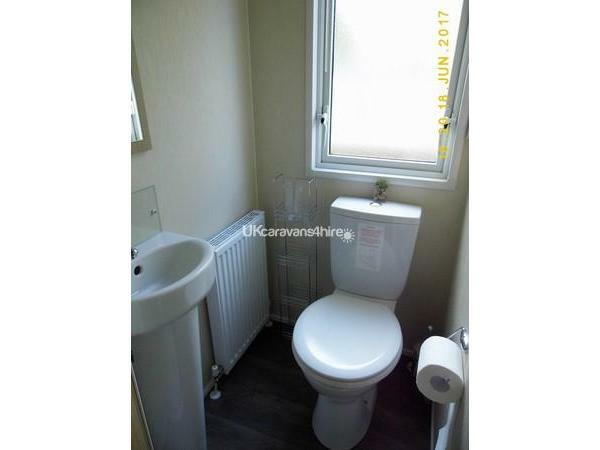 There is also a second toilet with a small sink. To the rear of the caravan there is a south west facing, secluded and secure decked area with table and chairs plus a private rear garden backing a field. To the front of the caravan there is a driveway offering parking for 2 cars. NEARBY: The closest villages are St.Minver & Pityme where there are local pubs. The caravan is approximately 2 miles from Rock which lies on the Camel estuary opposite Padstow (a ferry operates between them). In Rock you can learn to sail, water ski and windsurf or enjoy a coffee or wine at the numerous bars/restaurants. There are a couple of golf courses (Roserrow and St.Enodoc) close to the park as well as many walks. A short distance away is the dog-friendly beach of Daymer Bay and also Polzeath Beach which is a well-known for its surfing. Both beaches have car parks and Polzeath offers surfing lessons and surfing equipment for hire. The local town of Wadebridge has 4 supermarkets (including Tesco, Aldi and Lidl), a wide variety of independent shops, a small cinema, local leisure facilities and is the main base for the Camel cycle trail that runs between Bodmin and Padstow. NOT SO NEARBY: Further afield you can get to the Eden Project in around 40 minutes and The Lost Gardens of Heligan in 50 minutes. Or visit the towns of Truro, Bodmin and St Ives within the hour. FAMOUS CORNWALL: You can visit Padstow, a fishing harbour famous for the many restaurants and shops of TV chef Rick Stein. Or visit the nearby location of Port Isaac, featured in the TV series Doc Martin and more recently the film 'Fisherman's Friends'. Poldark was filmed in numerous locations close by including Bodmin Moor, Charlestown (St. Austell), Truro and St.Agnes. PLEASE NOTE that bed linen (quilt covers, base sheets and pillow cases), towels and tea towels are NOT provided. A double quilt and 4 single quilts plus pillows ARE provided. Electricity, gas and water ARE included in the price. Prices are PER WEEK and run from Saturday 4pm to Saturday 10am. In quieter months there is greater flexibility with the dates. Additional Info: Indoor heated swimming pool and sauna (pass required). Bar and restaurant. Evening entertainment (pass required). Amusements and indoor soft play area. Adventure playground. Shop. Nature walks. Beautiful caravan very clean and comfortable. Lovely wrap around verandah and pretty rear garden. My daughter said it was the nicest caravan she had been in. Exceptionally good value for the money I would not hesitate to book again. In addition to this very pleasant owners to speak to. Thank you for your lovely review, it is really appreciated. Please thank your daughter for her positive comment as well. We are so glad you enjoyed the caravan and hopefully got to see a bit of North Cornwall. We had a great week in the caravan. It was clean and had all the comforts of a home, in a great setting to explore Cornwall. The decking areas were great as you could get a little sun for breakfast and when you returned in the afternoon could relax on the veranda in the sun at the rear. Enjoyed watching the little birds in the garden. Rob and Lynda were quick to respond before and after the holiday. Thank you for allowing us to use your lovely holiday home. Thank you so much for your positive review. We are glad you were able to make use of the decking both in the front and the rear of the caravan. We love to try and identify the birds. One year, we had a very friendly blackbird that ate halved grapes from our hand.Thank you both for looking after our caravan. Spent a great week with three our our grandchildren, caravan was clean and well appointed. We had a great time and would highly recommend this caravan. Thank you for your positive feedback it is greatly appreciated. We are glad you had a good week with the grandchildren. My partner and I stayed here with our 5 month old daughter at the end of June and we all loved it! The weather was fantastic so with the help of all the information provided in the caravan, we really got to explore Cornwall. As for the caravan what a great position with views from the back over the fields and close enough to nip to the shop and swimming pool on site. Our journey down took quite some time due to traffic so it was lovely to walk in and find the personal touches from the owners such as the postcard, biscuits and fridge magnet for us to keep, aswell as the games and dvds to use during our stay. The owners have really made the caravan a home from home. We will definitely be returning some time in the future. Thank you Keri for your lovely review. We are glad that you were able to explore Cornwall and that the leaflets and information proved useful. We look forward to welcoming you back in the future. 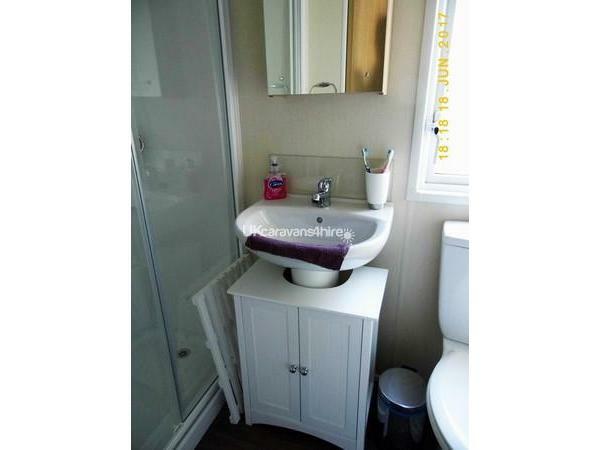 Lovely clean well equiped caravan home. The park was so quiet and the caravan is at the edge overlooking a field. Great location for Port Isaac, Tintagel etc. 5 mins by car to Rock for the boat to Padstow. Absolutely loved everything about this caravan and park. We had a breakfast and costa which was very good. The pool was wonderful and warm. I will recommend to family and friends. Thank you Lynda and Rob for our present. Very nice gesture. We will be back in the future. Thank you Sue for leaving such a lovely review. We are so glad you enjoyed your stay in our caravan and were able to take advantage of what Cornwall has to offer. We appreciate your recommendation to family and friends and look forward to welcoming you back in the future. Thank you for looking after our caravan. We really enjoyed our week's stay in this very comfortable, well-equipped caravan. It is located in such a peaceful location with only the birds singing breaking the silence. With easy access to North Cornwall. The owners, Rob & Lynda, provide lots of information and make booking very easy. We will definitely recommend this caravan to all our family and friends. And we will be returning as soon as we can. Thank you Julie and Terry for your kind review. We know what you mean about the bird song and love to sit on the decking and try to identify the bird. It's also a great spot for stargazing on a clear night. Thank you also for recommending the caravan to your friends and family, we greatly appreciate it. Excellent accommodation. Well equipped. Super comfy bed. Lovely quiet site, brilliant location would definitely recommend to family and friends, and we would definitely return in the future. Also thanks to you both for the gift you left us, much appreciated. Thank you so much for your positive review. We are glad you had a good holiday in our caravan and look forward to a possible future booking. Would highly recommend this caravan to anyone. Lynda & Rob have thought of everything & more . It's situated in a lovely peaceful spot & not overlooked by anyone . Lots of information is made available which was really helpful. The location is brilliant for doing all the coastal walks & there's so many places not too far away to visit.............. Will just have to return again !!!! . Thank you for your positive review. We too love the peace and quiet on the decking and watching the sun go down. We are glad you managed to explore the local area. Thank you for booking with us. Absolutely brilliant caravan in great location, one of the best caravans we have ever stayed in, everything you need and more. Brilliant location for all the places we wanted to visit and more and the detailed information pack & visitors information box in the caravan meant we could plan our days and see twice as much as we had planned. Lovely peaceful site with amazing decking areas to sit in private and just chill. Cant recommend enough and would definitely stay there again, will be recommending to all my friends & family too. Well done Rob & Lynda you really have thought of everything !! Thank you for such a positive review and for recommending us to others. We are glad you had a good holiday exploring Cornwall and then chilling on the decking. Thank you for booking with us. A short break at the end of the school holidays. From beginning to end this was such a great experience. Lynda couldn't have been more accommodating over our holiday dates and the caravan itself is the nicest we have ever stayed in. Home from home.There are so many little 'bits and bobs' in the caravan that make your stay easy and comfortable. The location is fab too as there are numerous beautiful beaches and villages to visit within a short drive. Can't wait to return - thanks very much Lynda and Rob! Thank you for your lovely review. I'm glad you made it down there in the end and were able to enjoy a bit of what Cornwall has to offer. Thank you for booking with us. Thank you Karyn. We are glad you liked the van and had a good time in St Minver Holiday Park. Thank you for your positive review. 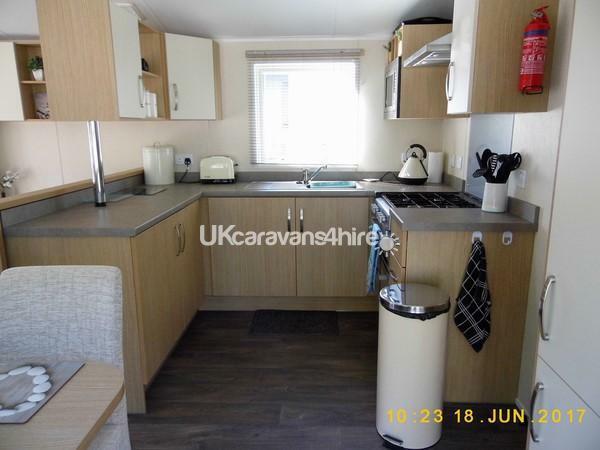 A beautifully clean and spacious caravan situated in a quiet location ideal for visiting lots of lovely areas such as Tintagel and Port Isaac. We found several good restaurants for evening meals, particularly The Quarryman. Perfect for our short break, hope to return again soon. Many thanks for your positive review. We are glad you enjoyed your holiday and look forward to welcoming you again in the future. Beautiful caravan with everything you need to make your holiday complete. Literally minutes from beautiful beaches and harbours. You have a shop, Costa coffee, swimming pool and takeaway pizza etc. A friendly pub is just behind the clubhouse where we had lovely food and live music. If you have young children there is a great programme organised every day to keep them amused. Ideal location if you just want to relax in the caravan as there is a quiet area around the back overlooking fields. Port Isaac, Padstow, Tintagel Castle, Bocastle, Polzeath are all within 5-20 minutes. We also had daily visitors coming to get fed. A robin, blackbird and a crow landed on the decking bannister wanting grapes, bread, or anything else that's going free. Would definitely recommend St Minver for the location, the lovely woodland surroundings, and the perfect positioning of Rob & Lynda's caravan. My sister is now looking to go there later in the year. Thank you Amanda for your lovely review. We are so glad you enjoyed the holiday and met some of the local wildlife. Many thanks again for your booking and for passing our details on to your sister. Super caravan in great location everything you need and more.Rob and Lynda you have thought of everything. We felt so at home in your lovely caravan.highly recommended if you want a peaceful holiday and get away from it all.Loved feeding the very friendly blackbird and squirrel.The decked area around the caravan is great very private at the rear.Great to sit out and chill in the sun.Would definitely go back!! Thank you for your review. We greatly appreciate your feedback. We are glad you enjoyed your holiday in our caravan. Pleased to hear that the blackbird is still going strong and being well fed. Fantastic caravan great location everything you could possibly want and more .somthing for everyone not matter what age. The owners have truly thought of everything to make this a truly loved haven,thankyou so much glad we stayed and will definitely be back next year cannot wait!!!!! Thank you for your positive review. We are glad that you had a lovely stay in our caravan and look forward to hearing from you when you are ready to book for next year. The dates and rates for 2017 are available online. One word to describe our stay in Rob & Lynda Caravan - Excellent. If you want a peaceful holiday this is the caravan for you. The accommodation is very clean, spacious and in a very quiet part of the St Minver Holiday Park, it's lovely after a busy day sightseeing - just sitting on the deck watching the world go by! The Clubhouse and Children's Play Area is just a short walk away from the Caravan for evening entertainment and takeaway food if you can't be bothered to cook. Would we stay there again - YES definitely. Thank you for your kind comments. Thank you also for letting us know about the friendly blackbird, not only does he eat crumbed scones from your hand but also halved red grapes. Should you wish to re book for 2017 please do not hesitate to contact us.